One day when I was probably about four years old, my grandparents called me and my mother over to the dining room with great fanfare. My grandparents, being book people above all else, used their dining room more as a library and media room than anything else, so it was occupied about 24 hours a day. They had one wall lined with floor to ceiling bookshelves, some of which had drawers in the bottom. My grandfather opened one drawer and brought out a plastic garbage bag with a great flourish. It was a giant bag, so I had high hopes, but they crashed when he opened it. He pulled out two tiny dolls. One was missing half of one leg and her eyes were all weird and the other was missing both arms and had half her wig ripped off. 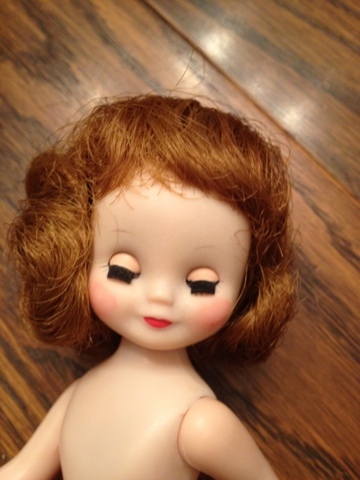 My mom was thrilled because these were her childhood dolls, but I found it a giant let-down. Little did I know, I had just been introduced to those two classic dolls: tiny Betsy McCall and Ginny! Understandably, I never saw what the big deal was about either one of these dolls. My mother would talk about how cute they were, but she had given them to me to play with, and besides the missing limbs Betsy's eyes were fallen back in her head and Ginny had only half her hair! I hadn't ever seen a mint Betsy, or even a good one. 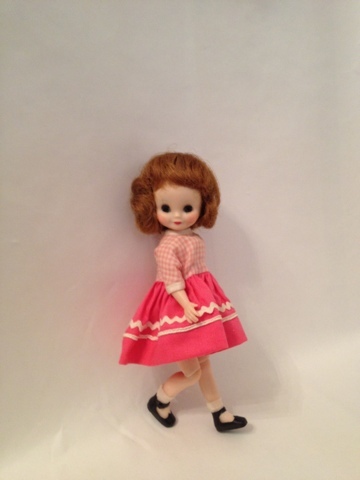 I remember once my great-grandmother called all excited because she had a McCall's magazine that had the paper dolls in it, but they didn't look like my doll at all. Later on my daughter played with that Betsy and she would always say, "She has a boo-boo!" No s**t! My mom did buy me some modern Ginnys, but I thought the classic one had a fat face. I did think my Lesney Ginny was very beautiful, but her bendable knees turned green pretty early on and then she always had to wear pants. Years later I used the Ginny in a college found object sculpture and tried to repair the Betsy. It soon became apparent that she needed so many parts it would cost less just to buy a better one, and then my mom did buy herself a replacement, so I sold hers for parts. Now, I can see why my mom thought her Betsy was so cute. She has a charming little face, especially to a young girl. When I opened the box and took this doll out my daughter said, "Oh! She's so tiny!" 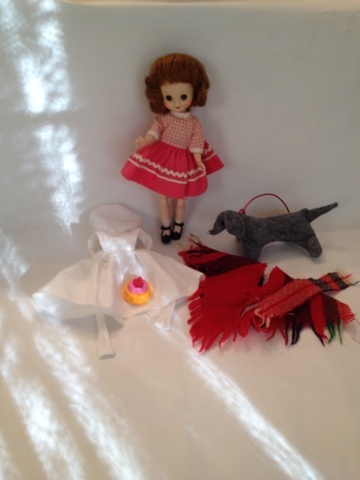 and loved her, even though the doll needed a lot of work and my daughter hasn't ever seen the Betsy paper dolls. So I am giving her some new Tonner Betsys of her own for her birthday this year. When in good condition, I found the original Betsy dolls to be quite adorable. This little lady had some issues in her nether regions. Her crotch and hips had split and her hips were very locked-up. Obviously the pressure on the interior joints was forcing them apart. Someone had tried to glue the crotch seam together, but it had come apart. I tried at least two times to do an exterior repair but that also kept coming open. It became clear that I would have to do a more extensive repair. So, I forced the joints open to the point that the hips could sit and stand and then I added room in each seam with Kwik Plastic epoxy. To keep the joints tight I used tiny silicone bands in the "ball" part of the ball and socket joint. The seams are widened and rebuilt with epoxy. Although Betsy can sit now her joints are quite tight so she can also stand. That means instead of pressing her legs to a surface to make her sit you have to ease each thigh into a sitting position. That protects all the seams, though, and should also preserve her knee joints, which are unusually perfect. The knees are usually the first to go on a Betsy! Once the epoxy dried it was time to sand and repaint. I knew the repainting would be difficult because the vintage Betsys are made of a unique plastic, which is almost translucent without being shiny. I did a lot of research to try to replicate the matte but translucent finish. Usually I would use oil paint on a hard plastic doll, but I read a tip from one restorer to use acrylic paint mixed with gloss medium. I only had high-gloss, which was too shiny, instead I used iridescent medium. The color matched very well and this was perfect for the doll's rubbed cheek paint. To get the right finish I used acrylic paint with iridescent medium. Once Betsy had her repairs, the fun began! 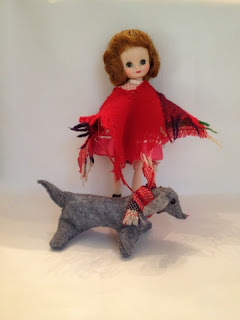 I love to do doll sets with lots of clothes and accessories. I especially love looking for miniatures to use in my sets. I always have loved little things. I used to have a giant bag of plastic animals and people. I called them my "little animals" and my favorite thing in the world was to spend the day arranging them on the floor. It was hard to do because the shag carpets of the time made them fall over. My grandmother was the only one who loved me enough to play that game with me; everyone else said it was too boring! But Grandma would sit on the floor for hours and help me set all my little animals up. Nowadays, I find the novelty erasers that are so popular make perfect doll accessories, and they're cheap! This little cake, a leftover party favor from my daughter's birthday, was the inspiration for this whole set. I could see Betsy baking for a cake walk or a bake sale, or her mother's birthday. 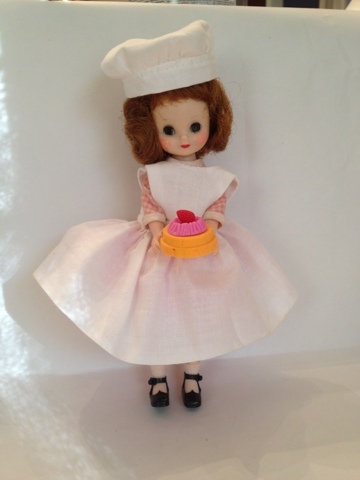 Once I made the baking set I thought Betsy should have an outfit for cooler weather. 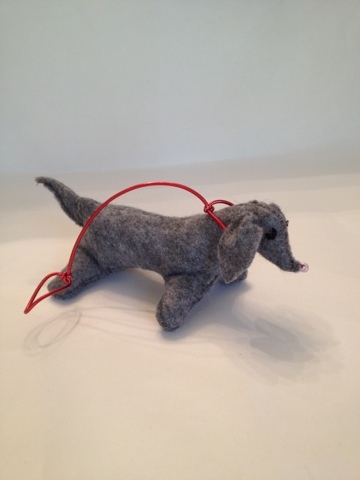 I was going to make a coat from the leftover Charlie Horse wool felt, but then I though how cute it would be to sew a Nosey dog for Betsy. I redrew a dog pattern, very similar to the Charlie Horse but at 50% size, to make sweet little Nosey. I wanted to use tiny black beads for his eyes but of course I didn't bring them with us to Mom and Dad's, so I had to embroider them. Nosey still turned out adorably! Then of course Betsy still needed a coat, but I found an old wool plaid scarf in a box of 50s scarves from my grandparents' and I decided to make a poncho. That was fast and easy, and then I thought Nosey should have a warm scarf too! I have such a great time with this stuff! Nosey and Betsy in their winter woolens. Finally, I repaired some seams on Betsy's original chemise and ironed her Recess dress, and she was ready to go! I have several more Tonner Betsys in the works with their own sets, and now I really want to sew those, but I am also very close to finishing a Dollikin with custom wardrobe...I have so many ideas I can't turn them out fast enough! Maybe someday I'll make enough to hire an employee or two!